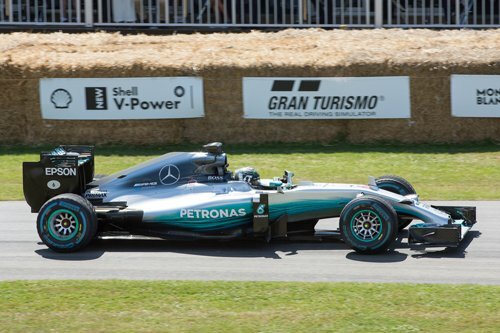 The Goodwood Festival of Speed is the world’s largest automotive garden party; set against the spectacular backdrop of Goodwood House in West Sussex. 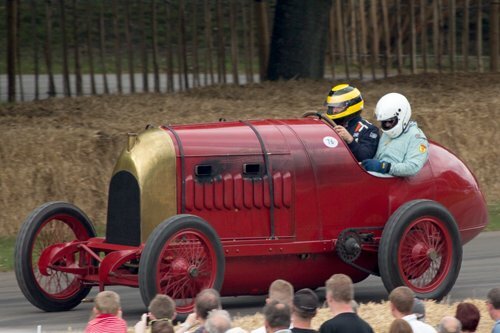 Over 600 cars and motorcycles spanning the phenomenal history of motoring and motor sport take part. International celebrities including some of the most legendary figures from racing, including F1 and Rally heroes, regularly attend. Expect hillclimbs and paddocks full of cars and bikes that trace the history of motorsport in all its forms. The event is invariably themed. The theme for 2019 is ‘Speed Kings – Motorsport’s Record Breakers’. This year's Festival will celebrate those drivers, riders, cars, motorcycles and teams that have gone further than their contemporaries in pursuit of perfection. From the intrepid early pioneers to today’s high-tech heroes, it will bring together the most celebrated and successful racing machines, which raised the bar in their respective fields. Not just individual speed records, but those who, over the course of a career, have set the benchmarks which the next generation aspire to surpass. We are delighted with this year’s theme, as it offers an opportunity to celebrate the ultimate heroes of motorsport past, present and future. The team are working hard to ensure the paddocks are bursting with the most talented drivers and riders alongside the most iconic road and race machines in the world. They are also delving into the more obscure corners of the motorsport world to ensure the Festival of Speed maintains and enhances its reputation as the greatest motorsport show on earth. One of the major theme will be celebrating Sir Jackie Stewart. 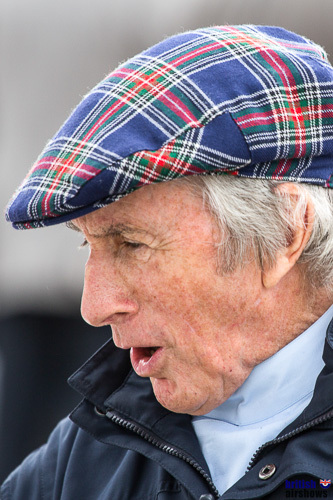 2019 marks 50 years since Sir Jackie Stewart won his first Formula 1 World Championship, and this summer the legendary Scot will also celebrate his 80th birthday. The Festival of Speed will celebrate both occasions by featuring a number of Jackie’s most famous cars on the Hill. The list will include the first car he ever raced: a rare Marcos Xylon Special, and the BRM P261 he drove to his first Grand Prix victory. This year also marks 20 years since Nick Heidfeld took the outright record up the Goodwood Hill, covering the 1.16-mile course in 41.6 seconds at the wheel of a McLaren MP4/13. In 2019, there will be a 'Sunday Shootout' when the fastest cars of the weekend will compete for the quickest climb. 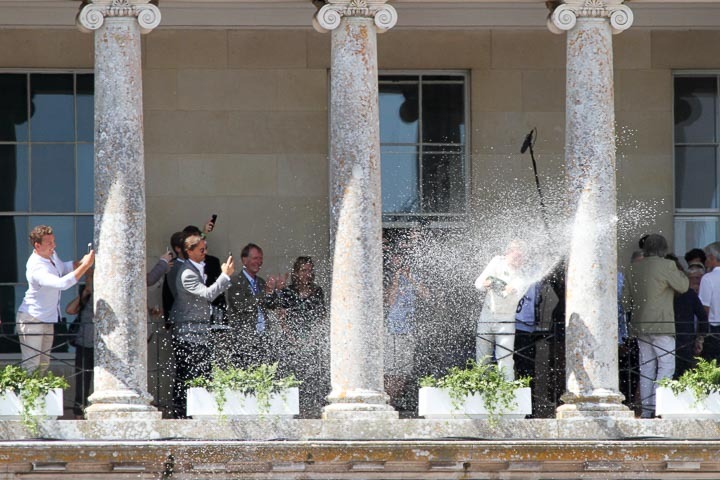 The three fastest cars will then be displayed outside Goodwood House. 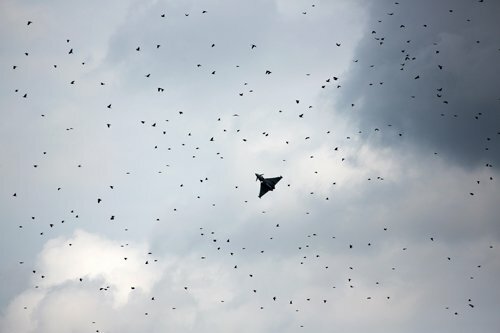 The Red Arrows are regulars. This year they are due to display on the Friday and Sunday. There will be quite a few changes to the layout and content of the Festival of Speed in 2019. The Supercar Paddock will move to the area where the Moving Motor Show used to be - close to the start of the Hillclimb. Where the Paddock used to be there will be an Arena that will feature extreme motorsport, such as drifting and other stunt driving in cars and on motorbikes. The stars of the stunts will also be available for signing sessions. As part of the changes, the Goodwood Action Sports zone (GAS) will move from its old position beyond the cricket field, much closer to the centre of the action and will have new features including an e-gaming area alongside the more traditional mix of motorcross, BMW stunt bikers and trials riders. 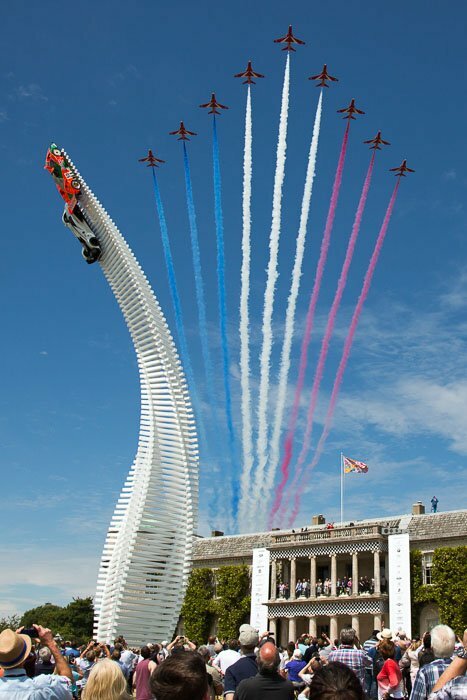 The Festival of Speed has a focus on cars, motorcycles, action bikes and virtually anything fast but there are also some top air displays - this year they included the Red Arrows and the Typhoon. For 2017 some exhibits also took a look into the future of some aspects of aviation. The theme for the Festival of Speed 2017 was "Peaks of Performance – Motorsport’s Game&dash;Changers", celebrating racing machines that were so fast, powerful, expensive or complicated that the rules had to be changed to allow them to race. These are the high-watermarks of motorsport; cars and motorcycles that left an indelible mark on the history of the sport. The event showcased the greatest examples of this theme, including unlimited sportscars, 1930s-era 750kg Grand Prix cars, Group B rally monsters and ground-effect and turbo-powered F1 racers. Plenty of F1 teams were represented. Top F1 and other race drivers from all eras, including Nico Rosberg, Valtteri Bottas and Robert Kubica, gave interviews, signed autographs and took cars up the hill and several F1 teams were in the F1 paddock exhibiting their machines. This year is the 70th anniversary year of the founding of Ferrari by Enzo Ferrari in 1947. To celebrate the anniversary, the Festival of Speed 2017 featured some of the most significant Ferraris, including competition sportscars and single-seaters, road cars and the very latest supercars. There was a special collection of Ferrari’s 250 models, a line-up of their latest supercars and more than 35 significant Ferrari competition cars including grand prix and sportscar endurance racers. Competition Ferrari models included around 25 iconic single-seater Ferraris, covering each of the key post-war Grand Prix eras. Highlights on the Hill included a 1948 166, 1952 375 ‘Grant Piston Ring Special’, a 1961 156 ‘Sharknose’, 1965 1512, 1974 312 B3, 1980 312 T5, 1984 126 C4/M2, 1990 641, 1995 412 T2, 2002 F2002, the F2007, and the current Scuderia Ferrari F1 team, not forgetting a pair of the Ferrari-powered, Lancia D50s. Solar and supersonic planes from Boom Supersonic, who are making a supersonic airliner faster than Concorde. A new 8ft model of the passenger craft will be on show with a VR experience so visitors can ‘walk through’ the future plane interior. A 4.8 wing-span model of Solar Impulse 2, which completed the first round-the-world flight by a solar-powered aeroplane . The Extra 330LE, an electric plane holding two performance world records – fastest speed for an electric plane and fastest climb (3,000 metres in 4m22s). Before Goodwood became the prime racing circuit in the UK, that honour was held by Brooklands, which had hosted motor racing since 1907. 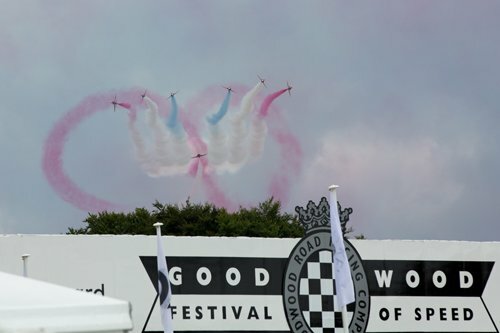 To celebrate the 110 year anniversary of the first competitive event at Brooklands, the Goodwood Festival of Speed hosted to an array of cars and motorcycles associated with that circuit's history. The famous banking at Brooklands enable sustained high speeds so it became the chosen venue for many early Land Speed Record attempts. These were represented at the Festival of Speed by cars such as the Blitzen Benz, Fiat S76 and ‘Babs’. The track also hosted club events, which were remembered through the tiny Austin and MG specials and three-wheeler Morgans, which were a mainstay of club events. The first British Grands Prix were held at Brooklands in 1926-27 and was remembered through cars such as the Delage 15 S8s and the Napier-Railton Special, in which John Cobb set the ultimate Brooklands lap record, at 143.44mph, in 1934. Racing at the circuit had to end in 1939 with the outbreak of war, when Brooklands was pressed into war service. The outcome was the devastation of the track, including the famous banking, and by the time racing restarted after the war, Goodwood had become the home of British Motorsport. When the thrill is more important than the amount of ground covered, there is nothing quite like drift racing to set the heart thumping. In 2017, 'Mad’ Mike Whiddett made his fourth appearance at the Festival in his rotary-engined Mazda MX-5 Miata, codenamed RADBUL, burning rubber along with Dean Kearney, 2009 Prodrift European Series Champion in his Dodge Viper and James Deane, Drift Allstars European Champion in 2014, 2015 and 2016, driving his Nissan Silvia. On the three afternoons, Friday, Saturday and Sunday, these drift legends were judged by a combination of public voting and a speed trap on the first corner of Goodwood Hillclimb. Cars travelled sideways by the time they reached the first initiation point, achieving maximum drifting speed through the speed trap and maintaining the drift until the finish line. At the top of the hill, near the racecourse, the rally stage gave spectators a chance to see both historic and contemporary rally cars weaving through the rough, tree-lined stage. This year marks the 20th anniversary of the World Rally Car regulations, celebrated with more R5 cars than ever before, alongside R5 Ford Fiestas, Hyundai i20 and the debut of the Proton IRIZ R5. Group B machinery included the Audi Quattros, Lancia 037, MG Metro 6R4s and even the MG Metro 8R4 (a 6R4 with a 4.6L V8 engine). There were also some of the future stars of rallying in their R2-specification cars: Tom Williams in a Ford Fiesta, Catie Munnings in a Peugeot 208 and Chris Ingram in an Opel Adam. After 47 years, at the age of 72, Bron Burrell was back behind the wheel of ‘Puff the Magic Wagon’; the Austin Maxi she drove in the 1970 London to Mexico World Cup Rally. Other rally highlights this year included James Martin in his 1963 Morris Mini Cooper and the Citroen 2CV BiBip Dakar. The 1963 2CV featured a reinforced the chassis, beefed up suspension and two Citröen Visa engines to boost the power output to 100bhp. From historics, the Festival of Speed also featured the futuristic: flying cars, electric planes and a driverless racing car capable of speeds of up to 200mph: ROBOCAR– the world’s first driverless electric racing car, designed to take part in ROBORACE, a motorsport championship for autonomously driving, electrically powered vehicles on Formula E circuit. Alongside were exhibits from the future of flight, with Flying cars from NeoXCraft, a British designed product, engineered and built by VRCO. This concept is for a future private, luxury flying road vehicle, in the quadcopter style. It is a leading example of the hot topic of VTOL (vertical take-off and landing) craft, which are strongly influencing the future of private land-to-air transport solutions today. PAL-V ONE (Personal Air and Land Vehicle), a vehicle design which combines a gyrocopter with tricycle undercarriage was on display alongside Solar and supersonic planes from Boom Supersonic. Boom Technology is making a supersonic airliner faster than Concorde, yet so efficient tickets will be affordable to the average airplane passenger. The plane will fly at a speed of 2.2 Mach, so could reach London from New York 3hrs15minutes. A new 8ft model of the passenger craft was on show with a VR experience so visitors could ‘walk through’ the future plane interior. A 4.8 wing-span model of Solar Impulse 2 was at the show. Solar Impulse 2 made history last July when it completed the first round-the-world flight by a solar-powered aeroplane. The theme for the Festival of Speed 2016 was ‘Full Throttle - The Endless Pursuit of Power’. It celebrated the most powerful cars and bikes in the history of motor sport. Other themes celebrated the 100th running of the Indianapolis 500; the inaugural Can-Am Series 50 years ago, and the career of James Hunt on the 40th anniversary of his World Championship victory with McLaren in 1976. BMW 328 Touring Coupé ‘Superleggera’ that won the Mille Miglia in 1940, taking four of the top six positions and setting a record average speed. BMW 1800 TiSA that won the Spa 24 Hours in 1965 – the first of 22 victories for BMW in the Belgian endurance classic. BMW R 50S Kaczor, named after bike racer, designer and BMW engineer Ferdinand Kaczor, who set a new lap record on the Nürburgring Nordschleife in 1969, riding a BMW of his own design. BMW M1 Procar. A field of identical BMW M1 Procars was the basis of the greatest one-make series ever created. Procar supported the F1 World Championship in 1979 and 1980, with Niki Lauda winning the first championship, and Nelson Piquet the second. Brabham-BMW BT52 that won the World Championship in 1983, driven by Nelson Piquet – the first in a turbocharged car. BMW M3: still the most successful touring car in the world, winning multiple championships, including the World Touring Car Championship in 1987. BMW 635 CSI that won the Spa 24 Hours in 1983, 1985 and 1986, and the European Touring Car Championship in the hands of Dieter Quester. McLaren-BMW F1 GTR Long Tail that finished 2nd and 3rd at Le Mans in 1997. BMW V12 LMR that won the 1999 Le Mans 24 Hours – BMW’s only outright victory in the famous endurance race. BMW M3 DTM that won the Sebring 12 Hours in 2010 and 2011 and the American Le Mans Series GT Championship, and was a Class winner – GT Pro – at Le Mans in 201. BMW S 1000 RR: Michael Dunlop won the senior TT in 2014 on an S1000 RR, 75 years after Georg Meier won the TT in 1939 on a BMW, becoming the first non-British winner. 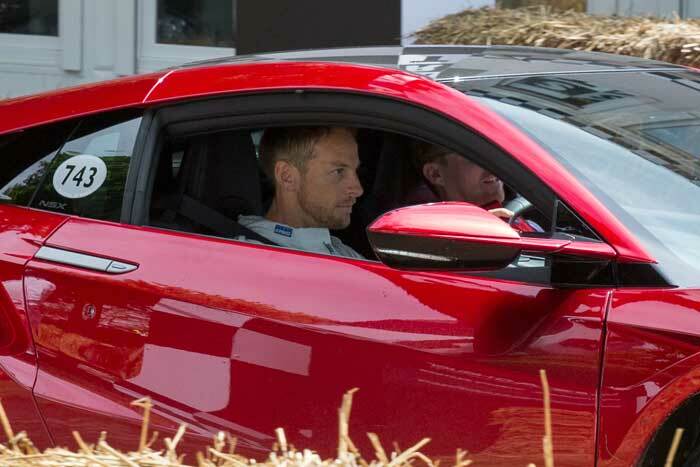 The car in which Jenson Button became Britain’s 10th Formula 1 World Champion was at the 2016 Goodwood Festival of Speed when Sky Sports F1 commentator and former F1 driver Martin Brundle took the Brawn BGP 001 up the hill. Having been inactive since the end of the 2009 season, Britain’s only World Championship-winning car from the 21st century was prepared for its Goodwood debut under the watchful eye of Brawn himself. Ross Brawn had been the technical director of the Honda team and had been with Michael Schumacher during his championship-winning years at both Ferrari and Benetton. He bought the team from Honda three weeks before the Australian Grand Prix, officially changing name to Brawn GP 11 days later. The Brawn team went on to dominate the first half of the 2009 season, winning six and finishing no lower than third in the first eight races, with Button taking all six victories. A further two victories for Rubens Barrichello and two podium finishes for Button secured the Constructors’ Championship for the brand-new team. The BGP 001 was instantly quick, becoming the only new constructor to win its first two races since Alfa Romeo won the first two rounds of the inaugural World Championship in 1950. Having secured both the Drivers’ and Constructors’ Championships, Brawn GP remains the only team to hold a 100% success rate in F1. The team was sold to Daimler AMG in November 2009 and was rebranded as Mercedes GP. Grand Prix cars from seven contemporary Formula 1 teams went up the hill at the Festival of Speed 2016 including then reigning double World Champions Mercedes-Benz; Ferrari, Force India, McLaren, Red Bull, Renault and Williams. Nowhere else, off the F1 track, can so many F1 cars be seen in action in one place, with an unrivalled level of access to both the cars and the drivers. Amongst F1 stars, past and present, who appeared at the Festival were Force India’s Nico Hulkenberg, 2009 World Champion Jenson Button, Nico Rosberg, Derek Bell, Jackie Stewart, Marc Gene, Riccardo Patrese and Rene Arnoux. A car from the FIA Formula E Championship made its first ever Festival of Speed appearance in 2016. Renault E.Dams, the reigning Formula E champion team, gave its title-winning Spark-Renault Z.E.15 several runs up the hillclimb during the weekend. In just two years Formula E has become popular worldwide, with race events in city centres and the entire race meeting (practice, qualifying and the race itself) all taking place on one day. The 2016 finale took place only a week after the Festival so Formula E’s presence at Goodwood was the perfect opportunity for British fans to get up close to one of the leading teams and its front-running racer. Six of the top cars in the Dunlop MSA British Touring Car Championship climbed the Goodwood Hill in a timed shootout, bringing all the drama of the UK’s top motorsport series to the world’s biggest motoring garden party. The fastest was 2013 champion and Goodwood House Captain Andrew Jordan in his Motorbase Performance/Pirtek Racing Ford Focus ST, who completed the 1.16-mile route in 55.50 seconds, beating Matt Neal in a Honda Civic Type-R (2nd), Josh Cook in a MG 6 GT (3rd), Sam Tordoff in West Surrey Racing BMW 125i M-Sport (4th), Brands Hatch race-winner Adam Morgan driving his Ciceley Racing Mercedes-Benz A-Class (5th) and Jason Plato in the brand new manufacturer-backed Subaru Levorg of Team BMR (6th). Carl Fogarty returned to the Goodwood Festival of Speed for the first time in eight years. Representing the Triumph brand, Foggy rode two of the Triumph’s current bikes: the Speed Triple and the Thruxton R. He also rode two bikes supplied by the National Motorcycle Museum: the Triumph Bonneville that Malcolm Uphill took to victory in the Production TT and the 750cc Production TT winning Triumph Trident, known as ‘Slippery Sam’. Foggy rode these four bikes a total of four times over the Saturday and Sunday of the Festival, forming part of the joint Triumph/National Motorcycle Museum ‘Past and Present’ feature. While not on the Hill, the bikes were in the Motorcycle Paddock and on display throughout the Festival. Lancashire's Foggy is the most successful World Superbike racer of all time, scoring four WSBK titles in 1994, 1995, 1998 and 1999. He also competed in 26 races at the Isle of Man TT, winning three – The 1989 Production 750 race and the 1990 Formula 1 and Senior TTs. He also broke the lap record in 1992, setting a time of 18 minutes and 18.8 seconds at an average speed of 123.61mph, a record that stood for seven years. Other successes for Fogarty include victories at the 24 Hours of Le Mans, the Bol d’Or, the Ulster Grand Prix and the North West 200. In 1993 Foggy dominated the North West, setting a new lap record and winning both superbike races, beating road-racing legends Joey and Robert Dunlop to the top step. He last appeared at the festival in 2008. 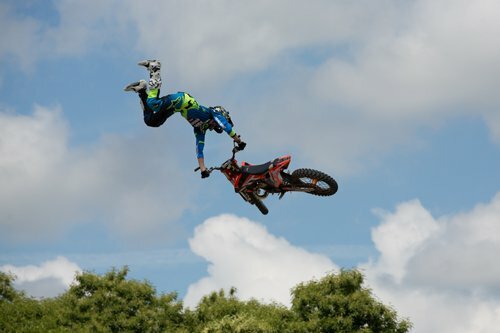 Goodwood Action Sports (GAS) returned to the Goodwood Festival of Speed for its fifth successive year, with a veritable who’s who of action sport stars all ready for four days of two-wheel fast-paced, high-octane motorised and pedal-powered fun and games. 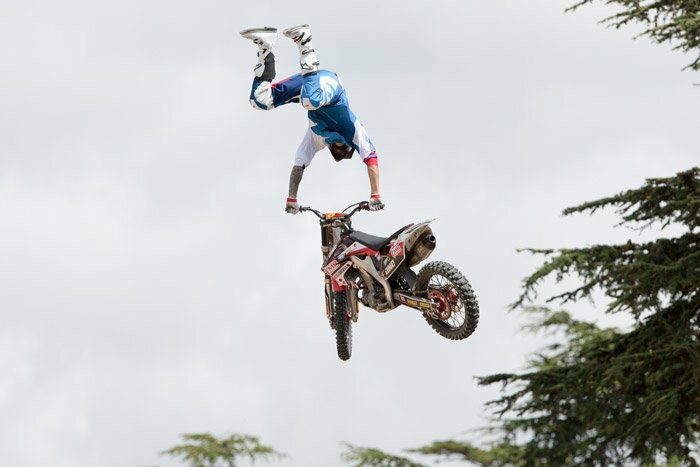 Freestyle Motocross, BMX Dirt, Trials and Mountain Bike were all represented by athletes at the very top of their game in three hour-long shows each day. GAS took up four acres of the site. The area takes some six weeks to build and over 10,000 tonnes of soil was shipped in. The giants of the FMX world, such as Jamie Squibb, the UK’s most successful FMX rider and the only Brit to be selected for the Nitro Circus Live line-up, X-Games gold medallist Edgar Torronteras from Spain and Czech Petr Pilat showcased their skills as they whipped and backflipped their way through a set of high-flying tricks. But the FMX boys didn’t have the Arena all to themselves because, as the title suggests, GAS encompassed all manner of action sports, Mountain Bike and BMX legends from all over the globe battled to be crowned the King of GAS in a jump-filled, double-lane course. British former World Champion Kye Forte joined Americans Chris Doyle, Mike ‘Hucker’ Clark and leading MTB trials star, Brit Chris Doney. Rounding off the big-name action was the legendary multiple British and World Trials Champion, Dougie Lampkin MBE. Fresh from winning his tenth Scottish Six-Day Trial Lampkin, together with Alexz Wigg, he scaled a range of hand-carved obstacles in the main GAS Arena. For those wanting hands-on experience there was the GAS Experience Zone where adventurers could try-out riding an electric or petrol-powered motorcycle for the first time all-day, every day. From the east and west, take the A27 towards Chichester and follow the airshow signs as you get close. From inland Sussex take the A29, A23 or A22 south to the A27 and head towards Chichester, picking up the signs as you get near. From further north, get to the M25, leave at junction 10 and head south on the A3 until you pick up the event signposts. Postcode for Sat Nav is PO18 0PX, but ignore it in favour of event signs when you get close. National Express have direct coach services from London, Southampton and Brighton with connections from further afield. All services terminate at Chichester bus station from where there is a bus service to the event. The nearest railway station is Chichester, with services from London Victoria. Alternatively, trains from Waterloo go to Haslemere about 30 minutes from Goodwood. Taxis are available at the stations. There is a special bus service from Chichester station to the show. Click the blue Expedia name for a list of hotels and guest houses near the show. The venue is already built into the link but when the list comes up you do have to enter your dates and, if necessary, adjust the number of rooms and guests. The International Hotels Group have a Holiday Inn about 20 miles away in Portsmouth and a Holiday Inn Express in Southampton, 30 miles away. There are six Premier Inn hotels within 15 miles, the nearest of which is in Chichester. No tickets on the gate.